Allow me to address your natural concerns about my being in control of a vast arsenal of nuclear weapons. There is some sort of briefcase they call “the football” that follows the President everywhere. It contains the means by which the President can launch a nuclear attack. Somebody has to carry it around and make sure it’s always nearby in case the President wants to obliterate millions of people with a nuclear bomb at a moment’s notice. “Can a woman really be in charge of nukes?” is a commonly voiced concern. Can she really do as good of a job as a B-movie actor in what we now know were the early stages of Alzheimer’s disease, or someone who was in charge of a major league baseball franchise while under the influence of copious amounts of cocaine, or someone who was once a lawyer? Can a woman do as well as these esteemed men at this job? What about her—womanly moods? I will do as all other presidents before me have done, one of the few sane things any of them have ever done. Or rather, I will do one of the few sane things all of them have never done. 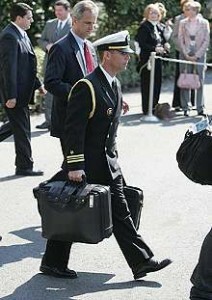 I will never, ever open this briefcase. Even if I get—really moody.